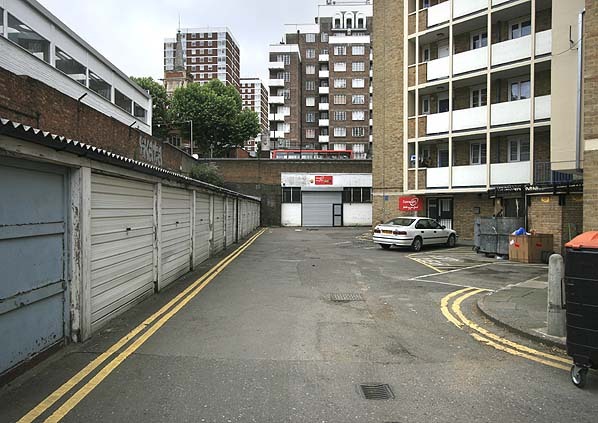 Present state: Flats and garages have been built in the cutting but the bridge is still extant and the area under the road is now in use as commercial premises. Evidence of the bridge can also be seen in the basement of the flats on the east side of the road. Notes: Shepherds Bush Station was sited in a cutting on the west side of Shepherds Bush Road. The station had two platforms each provided with a timber shelter protected by a canopy. The booking office was at street level on the north side of the line with two covered stairways down to the platform from the road bridge. A small signalbox was located at the south end of the 'up' platform. The platform buildings and platforms survived in reasonable condition until 1939 when they were in use as a builders yard but were later derelict. 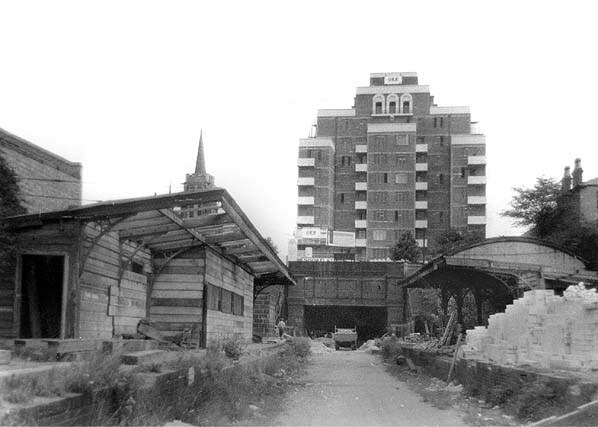 Whilst a block of flats was built on the trackbed to the east of the station in 1937 the station site remained undeveloped; and although the trackbed was filled in between the platforms sections the two canopies and the covered stairways were still in place until the mid 1950's. During the mid 19th century there were numerous proposals to bring railways to Richmond in competition with the LSWR who opened their station in the town in 1846. One of these schemes was promoted by the North & South Western Junction Railway who wanted to build a line from Kew Bridge to Richmond, with a connection from its Hammersmith & Chiswick branch into the proposed Hammersmith & City Railway near Shepherds Bush. In an attempt to stop other companies reaching Richmond, the LSWR planned their own line with connections to N&SWJR who would also be given running powers. The proposed Kensington & Richmond Railway was six miles in length running from a junction with the West London Railway north of Kensington (Addison Road) station, through Shepherds Bush and Hammersmith to meet the N&SWJR south of Acton. After crossing the Thames the line would then reach its terminus, often referred to as Richmond New (see timetable below) alongside and to the north of the existing Richmond station. By keeping the two stations separate, other companies wanting to reach Richmond would have to use the less direct access to the LSWR via the Kew and Barnes curves. This didn't please the LNWR, which was in a position to make it difficult for the LSWR to make junction with the West London Railway at Kensington. access to Richmond. 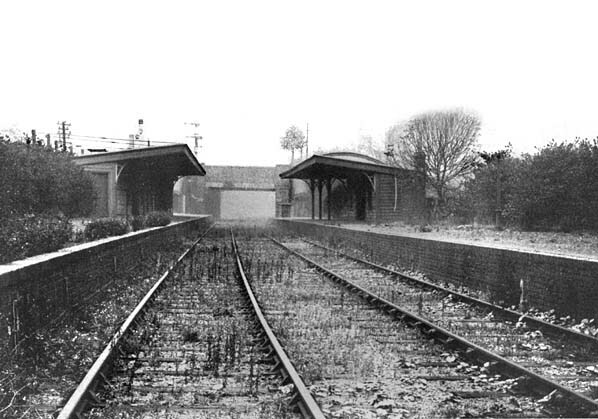 A joint H&CR/LSWR station was to be built on the section of the H&CR used by the LSWR trains. At South Acton, an ‘Acton Junction Line’ would allow trains to work from the N&SWJR to Richmond. A second act was required in June 1865 and at this time the arrangements were changed to provide a separate through line from Kensington with junctions on and off the H&CR, the intention being that some K&R trains would run over the H&CR to call at the joint station whilst others would by-pass it. This Act also sanctioned a ‘Chiswick Curve’, to allow the LSWR direct running from Hounslow onto the Kensington line just south of the present Gunnersbury station. The line opened on 1 January 1869 with an hourly service being provided by the LSWR between Richmond and Waterloo via the West London Extension Railway. On the same day, the LSWR introduced a service between Richmond and Ludgate Hill. The junction between the H&R and the H&CR was not used until 1 June 1870 when GWR trains started to run approximately hourly from Bishop’s Road, Paddington to Richmond but this service was withdrawn before the end of the year. Leaving the West London Railway north of Kensington (Addison Road) Station at Richmond Junction, the K&R curved westwards in a semi-circle to pass beneath the H&CR viaduct, then going due south, following the H&CR on its west side for 700yd, its tracks rising on a low viaduct to enter Hammersmith - Grove Road Station. From here the direction changed to west, running on a brick viaduct onto an embankment and on to Turnham Green Station and on to Richmond. As housing spread westwards at the end of the 1870's a new station was opened at Shepherds Bush on 1st May 1874. Further westward expansion either side of the line occurred in the last quarter of the 19th century. To cater for this, the Metropolitan District Railway began extending westwards reaching Hammersmith Broadway in 1874. On 11th August 1875 an Act gave the MDR running powers over the LSWR's line to Richmond in return for giving up ‘other routes’ to Richmond, Kew, Barnes and Putney. Under this Act, the MDR constructed a short link from its Hammersmith station to the K&R at what was to be known as Studland Road Junction. District trains reached Richmond on 1 June 1877. The new route was an immediate success carrying 54,000 passengers in the first month despite some accidents caused by the 2ft or more difference between the levels of the District carriage floors and the low LSWR platforms. These difficulties were soon overcome. 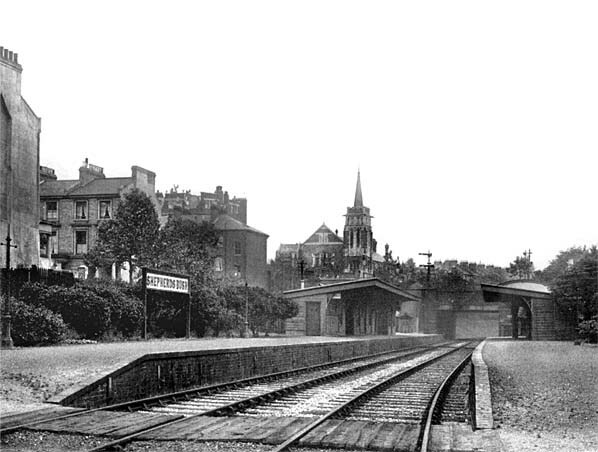 With the opening of the District’s line from Turnham Green - Ealing Broadway on 1st July 1879 the MDR became the major user of the west end of the K&R. Grove Road from 1 October 1877 using existing running powers. In January 1894 the GWR launched a joint service with the Metropolitan between Aldgate and Richmond via Hammersmith, Grove Road. The H&C was electrified on 3rd December 1906 after which the GWR’s steam service to Richmond was cut back from Aldgate to Notting Hill and withdrawn altogether after 31st December 1910. The Metropolitan had considered extending their electrification programme to Richmond but this was abandoned in 1914 and the connection with the H&R north of Hammersmith Station was removed in November that year. The LSWR was now very much the minor operator on its own line; in the early 1900's it was working about 28 passenger trains each way daily, compared with 61 by the other companies between Richmond and Gunnersbury. In the busiest 50 minutes of the morning peak at Richmond this combination produced trains of five different companies serving six different destinations (Broad Street, Waterloo, Ludgate Hill, Whitechapel, New Cross, and Aldgate). On Sundays, from 1902, some of the LSWR Clapham Junction—Kensington (Addison Road) trains were extended to Richmond and Kingston, a practice which lasted until Sunday 30 June 1912. An unusual feature of the summers of 1907 and 1908 was the operation of a daily train each way between Richmond and Salisbury via Hammersmith Grove Road and Clapham Junction. One of the sections of the MDR Act 1902 authorized the MDR and LSWR to work together on electrification which was completed on the District’s Ealing, South Harrow and Hounslow services in 1905. By now the jointly used short section of LSWR line between Studland Road Junction and Turnham Green was carrying some 500 steam and electric trains daily. In order to relieve congestion, the MDR sought and secured a new agreement with the LSWR for a quadrupling of the line between Acton Lane (west of Turnham Green) and Studland Road Junction. The new tracks, all LSWR property apart from two short sections, came into use on 3 December 1911. In the alterations, Studland Road ceased to be a physical junction with a new junction between the LSWR and the new lines at Turnham Green. With increasing competition from alternative electric rail services, electric tramcars and motor buses the LSWR began to cut its steam services over the K&R. By 1910 the weekday Waterloo service was down to 13 each way and Ludgate Hill to 10, there was also one train daily between Richmond, Kensington and Clapham Junction and a few between Battersea and Richmond. In 1912 the service to and from Richmond via the K&R ran to Clapham Junction instead of Waterloo; by July 1914 there were only two trains each way between Ludgate Hill and Richmond, a year later only one. 1915 saw the Richmond—Kensington— Clapham Junction service severely cut and converted to push-pull operation. did not propose to continue the £165 annual payment still being made for maintenance of Richmond Junction and its signalling. 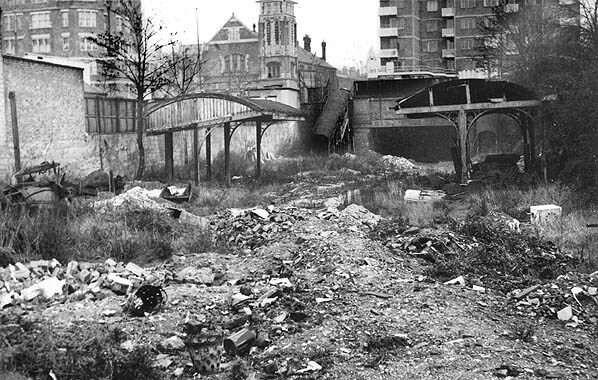 Despite speculation in The Railway Magazine that the War Office had vetoed any obstruction of the alignment between Kensington and Studland Road Junction in view of its possible strategic value for military traffic, the course of the disused line north and east of the H&CR Hammersmith car shed was offered on a 98-year lease in a Times advertisement of 13 December 1929. On 10th June 1926 a new agreement was reached between the MDR, the SR and the London Electric Railway. The London Electric & Metropolitan District Railway Companies’ Act authorised the Underground companies to take over and electrify the disused pair of tracks on the north side between Turnham Green and Hammersmith reserving to the Southern Railway the right to run ‘occasional and special’ passenger and goods trains. The viaduct round to Grove Road was fully restored in a fashion which would have made it possible to relay the track. However any speculation about the future of that section of the K&R was effectively dispelled in 1937 by the erection of a large block of flats across the alignment on the east side of Shepherds Bush station. Around 1950 an office block was built across the old line at Grove Road and in 1954 the line was further blocked by a new bus garage at the west end of Shepherds Bush station. The two stations at Richmond were combined into a single station on 1st August 1937.